It has been about a year now since I moved to Stockholm and this is always a good time to reflect on what I have achieved during that period. At first I was a bit disappointed. I thought that not much had changed in my life. I had decided to move to Sweden because I wanted to embrace the Scandinavian way of living: healthy, relaxed, environment-friendly, open, and with a good balance between work and life. After a year, I thought I was far from having achieved this. Then I realized that a few things had changed. I have been influenced by the environment, the people surrounded me. My participation in some major conferences here such as the Stockholm +40 conference on sustainable development or more recently the World Water Week all contributed to slowly changing my habits. Since moving to Stockholm I must have used my car not more than once per month. Last week I decided to go a step further: I will also give up public transportation as much as possible and will run to and back from work. We shall see how that goes in January … The other major change that I made in my life was the decision to buy fair trade and/or organic products as much as possible. This is a bit more challenging, not only because it is usually more expensive but mostly because it means running around the city to different stores as one will rarely find everything needed in one place. I haven’t been home much lately and I needed to replenish the refrigerator…. it was becoming urgent. My first priority this morning was therefore to put in practice my new principles and go to Primör, an organic grocery store. It wasn’t too difficult to implement my plan as I knew that I would run into a lot of unexplored cafés on my way to Primör. 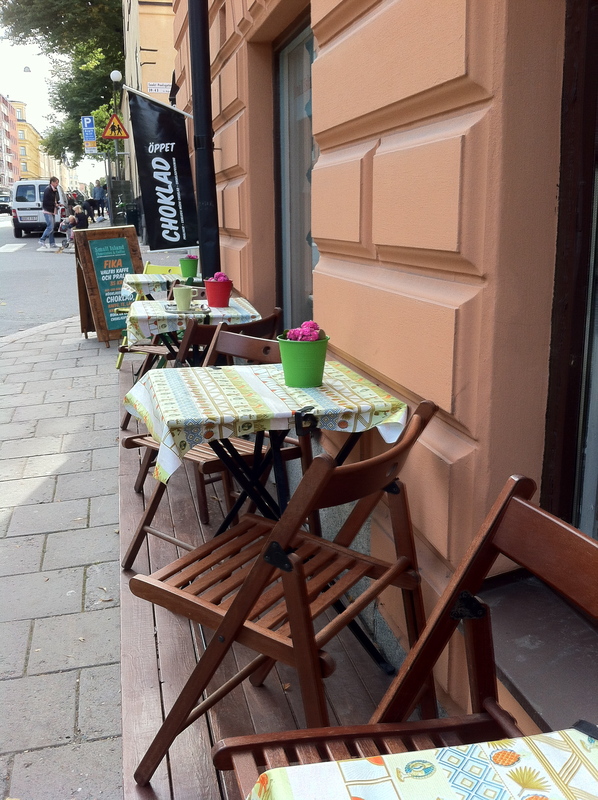 When I noticed the tables on the sidewalk up the street, I knew exactly where I would have coffee this morning. 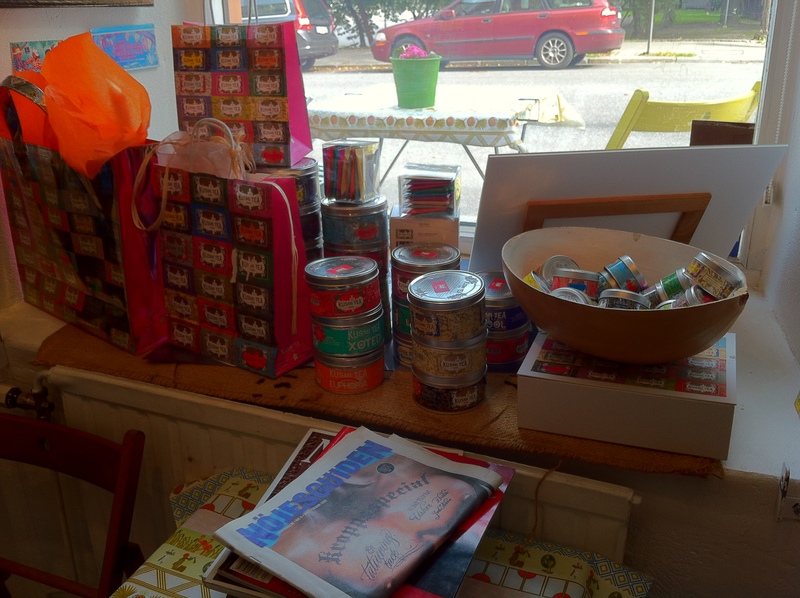 In fact, it became clear that this Saturday morning would all be about hedonism. 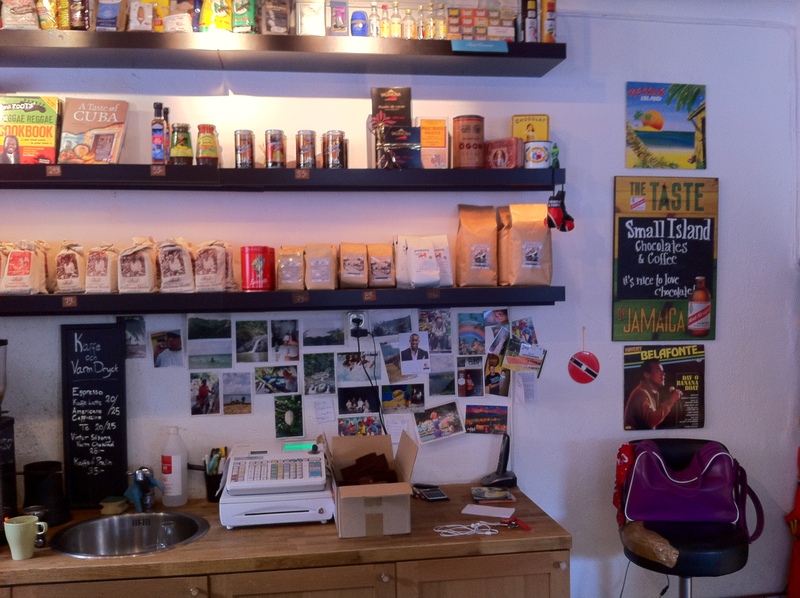 Small Island Chocolates and Coffee is more a boutique than a café. It specializes – quelle surprise! – in chocolates and coffee beans. 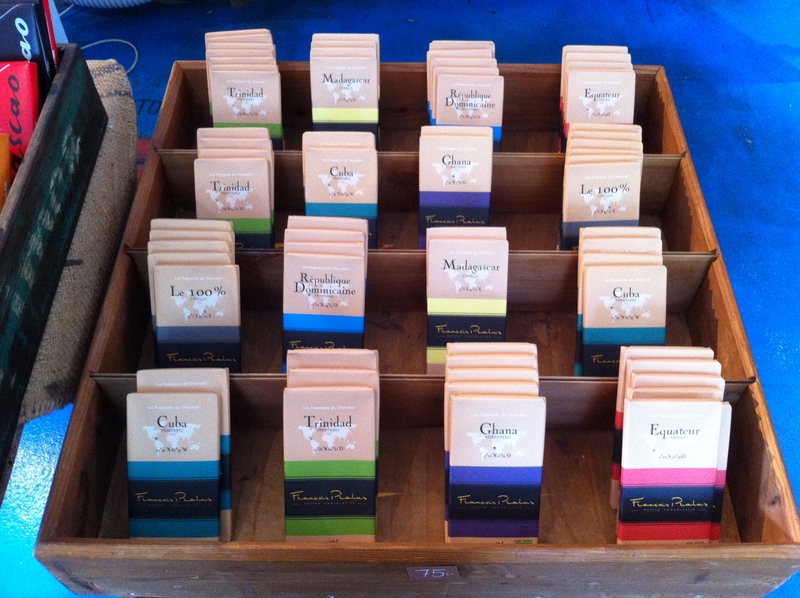 Although it offers a few chocolate pieces that one can eat on site, Small Island sells mostly high quality chocolate bars. 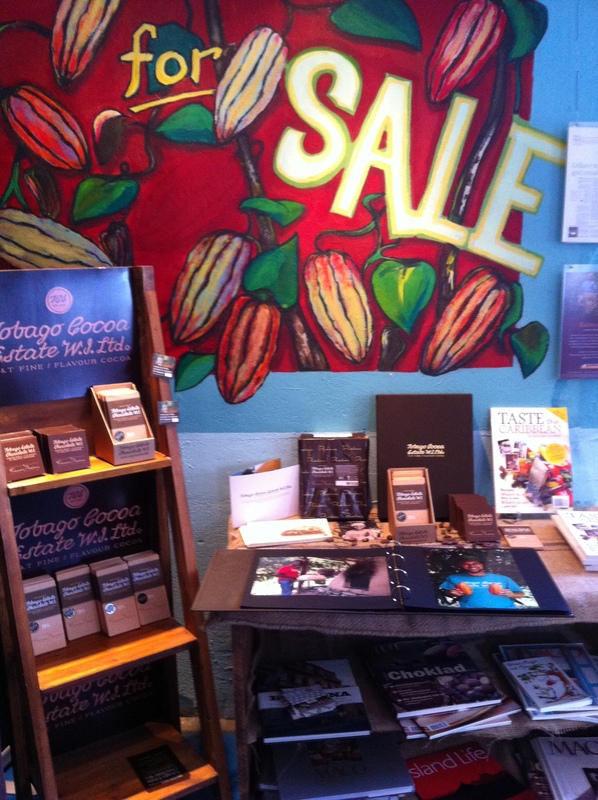 While one can find chocolates from all around the world here, there seems to be some focus on Trinidad and Tobago. In fact, Small Island has a partnership with a travel agent which specializes in travel to TnT. But there is much more than chocolates and coffe here: Small Island also specializes in Kusmi Tea and cigars (just for the records, I highly disapprove of all tobacco products). When I walked into Small Island I was welcomed by a nice girl with a beautiful smile. 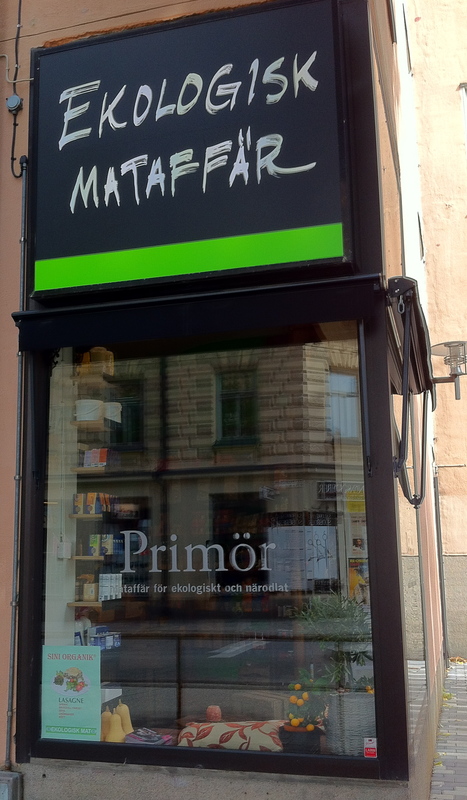 After explaining that did not really speak Swedish, I warned her that I would start with a cappuccino outside and then I would come back to buy the entire store. I decided to restrain myself after she explained that she would probably lose her job if I’d buy everything. Thankfully, there are things that do not change. 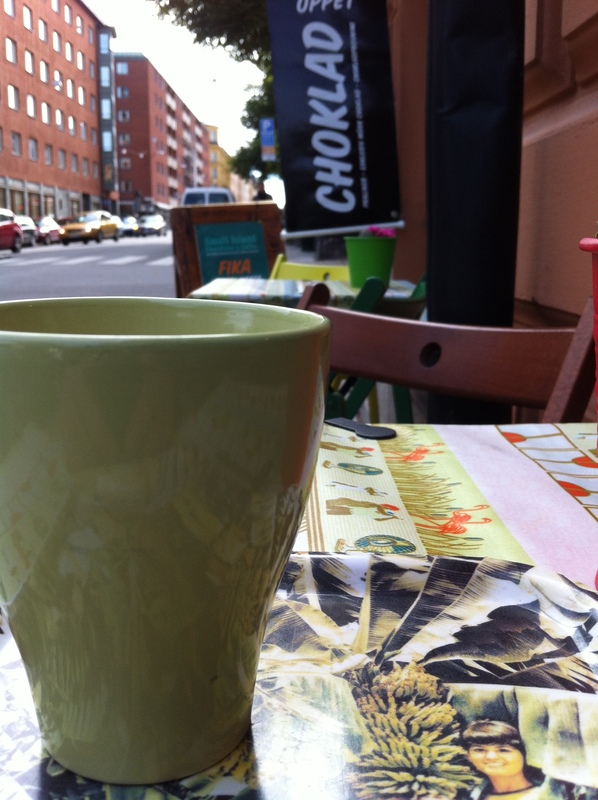 And I will continue to explore cafes in Stockholm as long as I live here. I don’t know how long I will keep buying fair trade and organic products, or if I will manage to keep running to work throughout the winter. But I feel motivated, and I suspect that this motivation comes in great part from a very inspiring friend I met a few days ago in Copenhagen. But that’s another story! Yeah, let’s talk about that in a couple of months! Although the usual holiday excess might be a good incentive to keep running! I’m “investigatively” reading backwards to see if I can figure out who your Inspirational friend is!! Yea I searched to no avail! Will be keeping an eye out! Mmmm, that chocolate sounds interesting!